Hate making coffee as much as I do? I bet you do. 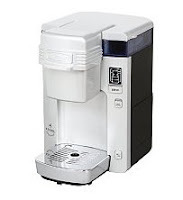 It doesn't get easier than this Cuisinart Single Serve Brewing System . This weekend Newegg is selling it for just $70, and tossing in free shipping too. I have no clue why this is so expensive, but I did some research and it's the cheapest I can find by $40 (retails for over $200). Because it's Cuisinart? Because it makes an epic cup of coffee? It does offer fresh coffee, tea, and more in under two minutes. With 200+ Keurig K-Cup per-measured, premium brand coffees and teas, you'll take more time figuring out what to drink than it takes to make it. In actuality, it does pay to spend a couple bucks more. As I mentioned, I absolutely hate making coffee. This one you just toss water in, slide a cup thing in place, and wait two minutes. And with it's own filter, think of the money you'll save not having to buy supplies. Click here to view this and other weekend deals at Newegg.com.